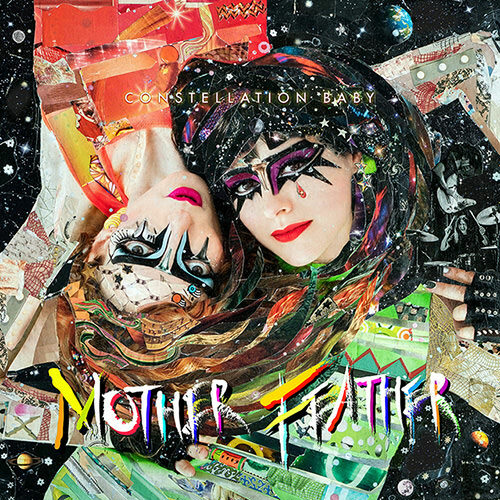 Mother Feather’s second album on the label Metal Blade is due this November. Can you tell us about the story behind the album Constellation Baby? Constellation Baby is a wish for myself, young girls and women, and everyone else. With this album we dive way deeper into the question, “Who is Mother Feather?” and the answer is extremely emotional. You’re seeing much more of the whole picture. I let myself be extremely vulnerable in the writing. The songs are still fun, urgent, empowering, and defiant, but I also let myself be immensely sad, which didn’t really exist on our debut. The wider range of experience that exists in the songwriting carried through to the production, and we ended up with much broader emotional palette and more evolved album than our first. My hope is that the honesty and extreme attention to detail helps connect with people and impacts them in a deeper way than we havebefore. The album artwork is pretty funky, and wildly colourful. Who produced the artwork? What solidified this as the choice for the album cover? The album cover is a commissioned piece by collage artist Katy Hirschfeld Leinoff. I had such a strong gut reaction to her artwork, which is so female-centric, emotional, richly layered, and fun. Her pieces are simultaneously gritty and poppy and I knew that her style would be perfect for Constellation Baby. We took the cover photo with Austin Phelps, an incredible photographer and artist who we knew we wanted to shoot with because of a similar gut reaction to his photos— particularly his beautiful, reverent portraits of women in natural light. For Constellation Baby, you started to work with Grammy-nominated producer Joshua Valleau. How has the creation of this album differed from previous releases under his guidance? right, which was abundantly clear at every stage of production. The first taste from the album Red Hot Metal was released some weeks ago. I’ve seen it described a ‘fever dream’ on some websites – can you explain to us what this means and how it feeds into the sound of the song? Red Hot Metal is about mental fire and going crazy, which describes the state I was in writing it. “Fever dream” also touches on the perspective shifts in the lyrics— it changes from line to line, and sometimes is multiple perspectives at once. In terms of the music, I wanted it to feel searing and almost out-of-control, like running from the cops. Do you have any plans for a music video? Yes! We have been cooking up the COOLEST video with Marc McAndrews, who did the Living, Breathing video. What are your plans for Mother Feather after the release of your second album? I am greedy for fans. I want to go to Japan, more of Europe, South America, and scoop up motherfeathers everywhere we go. They are everywhere, and I want to find them! To bring the interview to a close, we’d like to ask some ‘quick fire’ questions. Thank you for taking the time to speak with us today, it’s been a pleasure. Do you have any final words for our readers? Let a girl be your guide! Constellation Baby is due November 2nd, 2018.